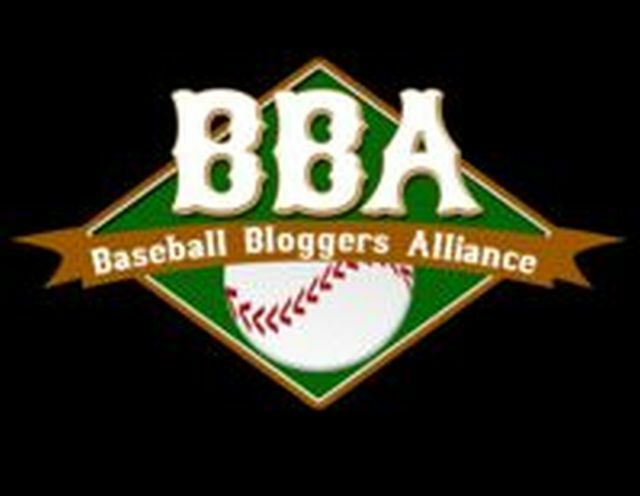 Clutchlings: Dunedin and the Blue Jays: What Does the Future Hold? Dunedin and the Blue Jays: What Does the Future Hold? 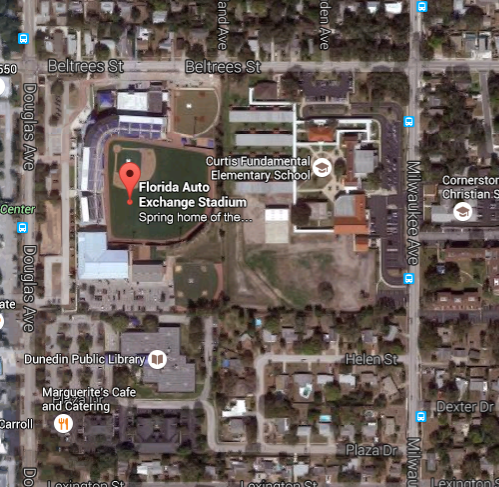 Nestled in a quiet section of Dunedin, a sleepy yet quaint Florida City of 36 000 on Florida's Gulf Coast, the Blue Jays spring training home of Florida Auto Exchange Stadium is indeed charming in many ways. Spanish moss hangs languidly from trees along the streets surrounding the ballpark, which is just two blocks from Florida's intercoastal waterway, separating the mainland from the sandy tourist beaches of the barrier islands. 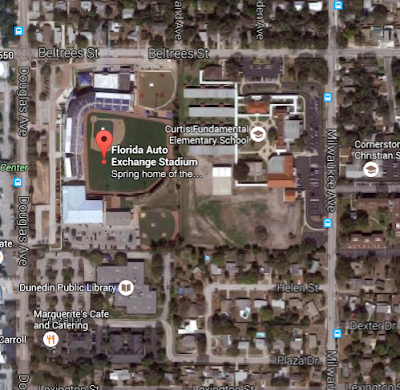 FAES sits on the site of Grant Field, the Blue Jays original Florida home, dating back to their birth in 1977. Above all else, however, the stadium is outdated. “The tools that allow players to both be on the field more frequently and to allow them to recover more effectively, to train in bigger volumes. You don’t want them to be crowded." The funding question also comes into play. 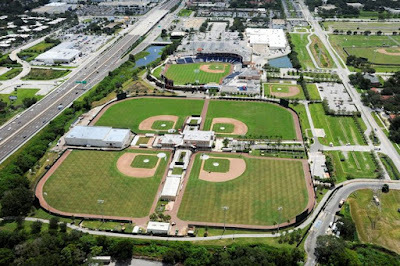 The Jays turned down money from the State when they backed away from joining the Astros in a new shared complex in Palm Beach Garden on the Atlantic Coast of Florida. Dunedin Mayor Julie Ward Bujalski has suggested that the city might be able to access the tax the state charges on hotel rooms (the "heads and beds" tax), which for Piniellas County is 12% - not an unsubstantial source of revenue on tourists - anyone trying to book a hotel in Clearwater Beach this month can vouch for that. The State of Florida has offered money to construct other minor league complexes, and the City no doubt hopes to be in line for some funding, which would be said to be in the $15 million range. The Blue Jays, for their part, have been relatively quiet on the subject. Former President Paul Beeston made all the right noises about keeping the team in town, while quietly trying to work out a deal to move in with the Astros. That source I mentioned earlier said that the city had offered to build a dormitory to house players at the minor league complex, but the team responded that they're not in the hotel business. Gracious in goodbye, Indians General Manager Mark Shapiro said the club appreciated the convenience of Florida and Winter Haven's support through the years. But what the team needs neither Winter Haven nor any other city in Florida was willing to provide: a state-of-the-art complex where players train, improve and mend year-round. What intimate Chain of Lakes, built for the Red Sox in 1966, offers in nostalgia and charm, it lacks in what Shapiro often describes as "first-division resources." After 15 years in Winter Haven, the Indians left Florida (where they had trained since World War II) for a new, $76 million state-of-the-art facility in Goodyear, which they share with the Reds. Unlike the current situation with Dunedin, it seems that relations between the two sides had seriously deteriorated. Could the Blue Jays similarly bolt for the desert? It seems possible. At the same time, there is more than a small amount of history between the team and Dunedin, the only spring training home the team has ever known. Then there's the matter of distance: Toronto to Tampa non-stop is just under three hours; Toronto to Phoenix is about five. And the cost per return flight is about $400 more. Certainly, this will not stop the most diehard and affluent of Blue Jays fans, but it will significantly limit access to their favourite team during March. Shapiro took a bit of a beating this off-season from fans and some corners of the Toronto media, and while on the surface he seems oblivious to it, he has to know that such a move, while helping to give the team a competitive advantage, would hurt the Blue Jays brand at the same time. And then there is the economic impact, estimated to be at around $80 million for the Dunedin area, which more than justifies the $50 million price tag of a new facility to Mayor Ward Bujalski. Complicating matters somewhat is that City Manager Rob DiSpirito, who headed talks with the Blue Jays on Dunedin's behalf, resigned in January after the City Commission unsuccessfully tried to fire him. Word came from Jeff Blair today that he expects the Jays to have a deal in place with Dunedin by the end of the season. Both sides appear to agree that upgrading the stadium site to become the focal point of this training and rehabilitation center, but there does appear to be a willingness to modernize the minor league complex, and create a "first-division resource." The political will appears to be there on the part of the City, and the Jays seem to be content to stay if facilities to their liking are built - the questions now become how much will each side be willing to pay, and where will the City come up with the funding?